Earlier this week, we sat down with ICO investor Ian Balina to interview him about ICOs and his journey within crypto investing. Read on to learn how a real ICO investor thinks and acts in this fast-moving space. Ian is an investor, advisor, author, and influencer within the ICO space. At the time of writing, he has about 20,000 subscribers on YouTube. Ian has appeared in The Wall Street Journal, Forbes, Huffington Post, The Street, INC, and Entrepreneur magazine. Ian is known for his transparent and data-driven approach to ICO investing. 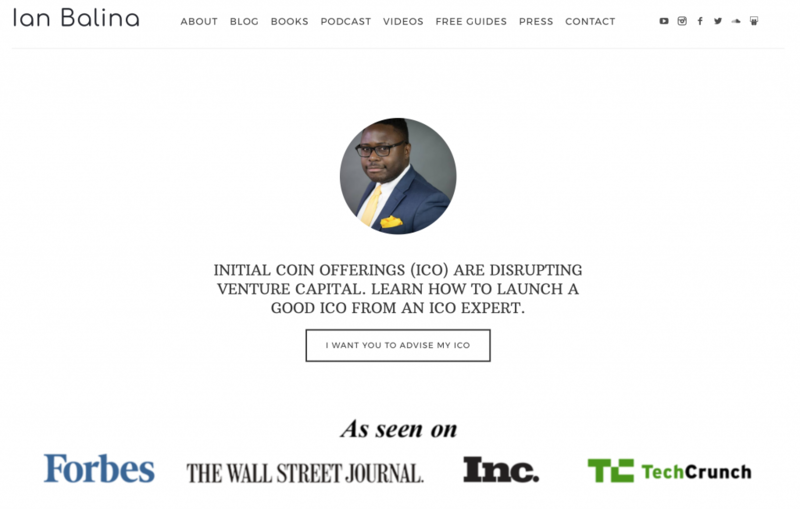 Who is Ian Balina, and how did you get into ICO investing? My background is in computer engineering and software development. I eventually moved on to IT consulting at Deloitte before going to IBM. At IBM I worked with IBM Watson analytics software for 3 years. Then I moved to enterprise sales as an open-source analytics evangelist for 1 year. In total I worked 4 years under the IBM Big Data brand. I was very hands-on with data – big data – going to Fortune 500 companies, trying to convince them to be more data-driven. This experience basically taught me two skills: 1) how to work data, and 2) how to take technical concepts and distill them into simple terms – essentially convincing CEOs and CIOs to buy IBM software. I was doing this as my day job. Then on the side I got involved in cryptocurrency investing. A buddy of mine was trying to get me to introduce him to the director of blockchain at IBM. So I went “sure, but why do you care about blockchain?”. He says “I’ve a crypto fund I’m launching, and I’m developing applications on the blockchain”. He told me he earned 200% on Bitcoin and Ethereum just by buying and holding. At this point I’m thinking “this beats 20% in the stock market – I’m in!”. I started slowly – watching, buying and holding. Earlier this year I got more active – after Token Summit. I started day-trading, swing-trading, before I got into ICOs. After a while I realized I was taking a lot of losses just by chasing FOMO, so I thought there’s got to be a better way to figure out which ICOs I should invest in. Given my background, I naturally thought about using data and analytics, so I adopted a “Moneyball approach” to investing in ICOs and token sales. Nobody was really doing this at the time – maybe they were privately, but not publically. So I became one of the first YouTubers doing this. I show people the process of how I evaluate ICOs in 2-3 hour live streams and videos. From my YouTube channel, I got a big following. I also put out a video which is now essentially the bible of ICO investing – a 60-minute long video which now has more than 100,000 views. It sort of went viral out of nowhere – I did not expect that at all. It was just filmed out of my basement. But nobody had really distilled ICO investing in a very thorough yet simple manner. I’ve now left my day job at IBM, and I do crypto investing full-time – primarily ICOs and token sales. I spend a lot of time finding ICOs to invest in, as well as networking with people in the space. I’m also a part of an angel investing group that invests in token sales and ICOs. We now hold several million dollars of assets in crypto. How has the transition been from doing this as a side gig to investing in ICOs full-time? It’s been fantastic! That’s one of the reasons I love crypto – it can change your life so fast. I’ve only been into crypto for around 1 year. But it has really changed my life in all facets – from investing, to the people I’m meeting, the business deals I’m getting… Just the same way as crypto can go 10X in 2 months – so can the people who are working in this space. Leaving my day job was something I was planning to do anyway. Having cryptocurrency investing was the icing on the cake. It made me think: now you really have to leave – there’s no reason not to! How do you discover ICOs, and how has that process changed since when you first started? Before I was just looking at ICO calendars like TokenMarket or ICOAlert.com. Usually I go between those two because they don’t all list all of the ICOs out there, so you have to cross-reference the two. Then I went through the upcoming ICOs, the ICOs’ websites, doing the homework, checking out the team… To find out what you’re actually investing in. Now, I’ve built up a big following. So now I don’t really have to go out and hunt that much. Instead the ICOs come to me. Typically if the same ICO shows up multiple times from different people, I’ll look into it. For example, if I get multiple people asking me to check out Quantstamp in a week, then maybe I should check out Quantstamp. Since you have started with ICO investing, what have your biggest successes been? The big ones were district0x (DNT) and 0x (ZRX). Those came out around the same time. DNT at one point did about 20X in a month. There was a rumour that they were going to be added on Bittrex, then they got added, but were later taken off. They made the news. So DNT was the first big success. That’s actually where I got most of my followers from. People were following my content on DNT, so when they went 20X, my followers were pretty happy about that! More recently, ChainLink was one I was very bullish on. I got in 2 months before the ICO. I was one of the earliest pre-sale investors. Towards the end I was less bullish though, but overall that was the biggest success last month. District0x, 0x, ChainLink … how important was the actual product itself for you in these cases? I’m not really the one to judge on the end-state products. Having said that, I always look for some kind of prototype or at least shipped code. I don’t invest in whitepaper ICOs. I don’t invest in only ideas. There has to be some kind of execution, showing the team’s abilities. That decision actually comes from looking at the data. When you look at the top 25 ICOs of all time, 90% had some kind of shipped code or prototype. So that’s just a hard rule for me. You have to do some kind of filtering. How do you figure out who’s worthy of your money? You mentioned data a couple of times. What are the most data sources for you when making investing decisions? Sites like ICOStats.com. There’s a new one called TokenData.io. They compile different stats. For ICOs that are harder to find information on, like those coming out of China, I use Bitcointalk forums. Going into the threads, getting all the token metrics there. Also, pulling out data from their whitepapers. Also, Google is actually really useful. If you use date filters and so on, you can find a lot of the data you need. Smith and Crown is another source I use. So I just go through all of these sources manually, compile the data in my spreadsheet, then sort on the best ROI. What about your biggest failures? Right now, the biggest failure has been Propy. It’s down 60-70%. I definitely have to change my grading system after Propy. Bancor was another one, although I didn’t lose that much. I held on to it for a while, but then when a pump came up I was able to exit at an OK point where I only lost about 10%. But it was a big bag that I was holding on to for a long time. Those really inspired me to stop chasing the hype. I don’t want to invest in an ICO just because Mark Cuban is backing it. I’ll do my own research, my own due diligence. A failure where I didn’t invest is MetalPay. They had a private pre-sale, and they cancelled their public sale. I missed out on that. A buddy of mine turned $2,000 to $50,000 in a couple of months. That inspired me to say: I can’t afford to miss any future MetalPays. I have to get into pre-sales. So I started getting into pre-sales months before the ICOs were happening. Same thing with OMG. They also cancelled their public sale, I guess because of the legal aspects of it. They only had a pre-sale. MetalPay and OmiseGO taught me that you have to get into the pre-sales. You can’t afford to get only into the ICOs. You’ve mentioned in your Ian Balina Telegram group that we might be going into an “ICO recession”. Can you explain what you mean by that and why you think that’s happening? The last few months every ICO has been going towards the moon. So many of them have reached their funding goals. But after China and Korea has been banning ICOs, money has been flowing out of the ICO space. Now, you often see the price dumping on EtherDelta right after the ICO. Even the good ICOs! It’s now often cheaper to just wait and see what happens on EtherDelta. Then, add on the Bitcoin fork. Bitcoin has done a 2X recently, and it seems like people are just happy to put all their funds into Bitcoin now. What was the nail in the coffin for me was Mercury. They’re backed by Mark Cuban, and had a fairly small cap compared to other projects – $24M. They’ve only raised $2M! That’s embarrassing. When you see stuff like that happen, it makes you think we’re definitely in an ICO recession. October was the first month were most ICOs didn’t hit their soft cap. Another example is Horizon State. Their cap was $60M, but they only raised $600k. This shows the misalignment in expectations that ICO founders and ICO investors have in the current market. Many founders right now are simply delusional. In general, investors are getting much smarter and much more educated. You now have much more of a community where it’s easier for investors to get information. And you can see this in the Telegram groups. People are asking much more sophisticated questions these days. So you don’t think we’ll just go back to the old times once the Bitcoin fork is over? No, investors have gotten smarter. ICOs are going to become more modest in their expectations for what they’re trying to raise. Quite a lot of ICOs were done in 2017 where the product is being shipped in 2018. Are there any that you’re particularly excited about? District0x is one I really like. I’m very bullish on it. I’ve worked as a freelancer, I’ve worked with marketplaces. I’ve launched a marketplaces app, and I’ve written a book on freelancing. So when you make marketplaces decentralized – I see the power in that. They just launched NameBazaar – basically a GoDaddy marketplace for Ethereum domains. But the power really comes when they release d0xINFRA – when they allow anyone to build marketplaces on their platform. Imagine having a decentralized Airbnb, eBay, Craigslist – all of these marketplaces on one platform. With District0x that’s possible. I think next year is gonna be very big for them. MetalPay is another one I’m bullish on. They recently released their alpha. What I like about them is that they’re really focusing on the end consumer. They’re not even that focused on people in the crypto space. They’re trying to take crypto mainstream by providing a simple payment solution. It’s crypto without knowing it’s crypto. I also think Marshall Hayner is a really good entrepreneur – he’s a really good founder. He’s also a great evangelist, and I think you need to have that in the team. Speaking of taking crypto mainstream, some people have asked what is the “Netscape moment” for crypto – what do you think this will be? I’m just speculating here, but it would have to be a big application that people use without knowing anything about the technology. What MetalPay is doing comes close: sending money like PayPal, but then having a chance to earn rewards from that. So that’s one. I don’t it’s going to be any of the big blockchains. It has to be something consumer facing that ends up going viral. People use it as a regular app, but they don’t know that it’s blockchain. I have no idea to be honest, but I think MetalPay is up there as a contender. Many ICOs are focused on the scalability issue. Zilliqa is one, Raiden Network another one. Decentralized exchanges is another big issue that many are looking to tackle. 0x and Kyber Network are two examples. What are some other problem areas that you think we’ll see ICOs for in 2018? Those are certainly some important problem areas. Scalability is definitely something that has to be solved. Video is another space that I think is big. I’ve invested in Flixxo. Decentralized video has to be done. I do videos online as a full-time job, but there’s still a middle-man on whatever platform you’re on. Decentralized video is something I’m really bullish on. Just think about how much time people spend on Netflix and YouTube. Incentivizing and monetizing that in a decentralized manner is very exciting. Same thing with music, to compete with Spotify and Pandora. It’ll be tough competition, but it could be huge. Who are some of the people you follow in the ICO and crypto space? I’ve been following Tai Zen from the beginning. He’s been very influential for me. Just to follow how he was investing. Then I follow many others – too many to name to be honest. Why do you think ICOs have become so popular so fast? It’s the crazy gains you can get without as much effort as day-trading. Take ChainLink as an example. 2 months after their pre-sale, they were at 4X. Being able to quadruple your money in 2 months, buying and holding – that’s an efficient way of making money. How do you think ICOs will impact VC (venture capital) going forward? There are many VCs trying to get into the space now. They see the crazy returns, and they’re forming funds to invest in blockchain-based startups. It’s actually pretty ironic, since many of the startups that first did ICOs did so because they were rejected by VCs! And now the VCs are trying to get in on the action. This is also a form of decentralization. Now the people can decide which ideas become reality – not just Silicon Valley VCs. Another benefit of ICOs is the liquidity: you can exit in 1 day or 1 month, so it’s also more liquid than traditional venture capital. As someone who values data, would you agree that ICOs also help us get more data on startups at an early stage? Also, just having a lot of people doing homework for you in evaluating startups in an open manner helps a lot. Where does Ian Balina see the ICO space in 2 years from now, or even 5 years into the future? Investors will definitely be smarter and more mature. Eventually it might converge with venture capital and angel investing. This will likely increase the quality of the projects that we see. It’ll be more competitive for startups, so they’ll have to really innovate to get our money. In terms of regulation, in the US we’ll probably see requirements for investors, meaning it won’t be as free as it is now. That’s why I tell people to get in now – the good times might not last! What is something that you believe, that other people think is insane? People think it’s insane to make all this information I put out there public, to educate people. That it’s taking away the returns for the industry. I think it’s the exact opposite – I think it creates bigger returns. I don’t believe in a scarcity mindset – I have an abundance mindset. Smart people will always find a way to innovate and to stay ahead of the curve. There’s always a next level. That’s why I’m not concerned with giving information out for free – sharing my spreadsheet and so on. Head over to ianbalina.com to follow all the awesome content Ian is grateful enough to share with the rest of us. Thanks for talking to us, Ian Balina! Great interview. The standard now is for the team to work on the ICO, then the platform. In the future, regulation may demand the platform first before the ICO so that the tokens give investors an immediate use after token distribution. Thanks John! Yes, you’re probably right on that. It will be interesting to see how heavy the regulations will become – and to see how much of the regulatory burden is placed on the startups vs the investors. Well written and very interesting piece ! Ian Balina seems to be in the epicenter of the ico space and definitely an important character. it was very interesting to read how he answered your questions!